From time to time this post comes up. The suicide of a famous person. I don't try to address all of them as they happen. But occasionally one stands out from all the rest. Anthony Bourdain's is one of those. 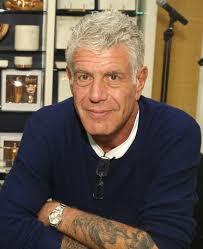 According to Wikipedia, "Anthony Michael Bourdain (June 25, 1956 – June 8, 2018) was an American celebrity chef, author, travel documentarian, and television personality who starred in programs focusing on the exploration of international culture, cuisine, and the human condition. He was considered one of the most influential chefs in the world." For the last few days, many people in my circle of friends and acquaintances have commented on this. How could it happen? Why would he want to kill himself? As with all suicides, hindsight is 20/20. A few have taken to the internet to comment on Anthony's behavior and actions. His struggle with depression was no secret. But still. Let me set a few things straight here. - Just because you are a follower of Jesus doesn't mean you are immune to depression. - As a follower of Jesus, if you are struggling with depression, it doesn't imply that God doesn't love you or that your faith is "broken." - Thinking about suicide, while a dangerous thought, isn't a sin. - Just because someone else did it doesn't mean you can too. What should you do if you are struggling with depression? - Medication can help, but it isn't a cure. - Find someone to talk to. A good friend, a therapist, a pastor or a counselor. - Don't ignore it, it will not go away on it's own. - Take a hard look at your 5 closest friends. If they are not helping, change friends - quickly. - Finally, ask God for help. On that last one, many of you might have just said, "I have. But God hasn't." I'm going to blog on that tomorrow.